Shamans worldwide have long known the secret that there is another reality. In this other world, filled with power and healing, live beneficent helping and healing spirits that work with the shaman to help alleviate pain and suffering in others. They are the animal allies and spirit teachers who can help us solve life problems and give us strength and protection. Each person has her own helping spirits but may be unaware of who they are. The teachers are known by many names — Tara, Jesus, Buddha, White Buffalo Calf Woman, Merlin, Kuan Yin, Old Woman, Ix Chel, Guadalupe and Isis, to name just a few of the thousands. Shamans work in partnership with their healing spirits and have been helping people for over forty thousand years on every inhabited continent — in Africa, Asia, North and South America, Australia, New Zealand, and Europe. But what is a shaman and where is the other reality? How does the shaman get there? Shamans are women and men who are called by the compassionate spirits to help people in their community solve problems, heal illness, and restore well-being. The word shaman comes from Siberia and means one who sees in the dark. Listening to the beat of rattles or drum, a shaman enters an altered state of consciousness and is then able to travel into the hidden universe on behalf of those who need guidance and healing. Imagine entering a darkened room with a candle burning and fresh, aromatic cedar incense. You’ve come here to meet the shaman to ask for help. You have an important question that urgently needs an answer. Or perhaps you seek healing for symptoms you are experiencing — lost passion, health problems or missing the feeling of being really alive. You request the shaman to seek spiritual help for you. You lie down next to the shaman on a colorful tribal rug and the drumming begins. The shaman enters a shamanic state of consciousness and travels on the sound of the drum as on a herd of horses, into the other reality where hidden sources of wisdom and healing await her. She arrives into the spirit world which may appear as rugged mountains, red desert, meadow or starry night sky. She greets her spiritual helpers. They may be a herd of reindeer and an old woman teacher or perhaps a council of aboriginal elders and a black panther. She knows them intimately. They have chosen her to be a shaman who helps others. She greets them joyously and presents your problem or symptoms to them. They are here to assist you with all the power of the universe. Perhaps you have asked for help to heal your broken heart or prepare you to meet your soul partner. Maybe you need healing to recover from a car accident or the loss of your mother. If there is a spiritual dimension to your problem or illness, the spirits and shaman are able to help you. They eagerly go to work on your behalf. Lying beside the shaman, you make yourself open and receptive to receive the healing help. You have surrendered into the healing hands of the compassionate spirits. You feel welcome and safe here. The shaman travels far, perhaps flying on the back of her eagle spirit or on the cloak of her spirit teacher. Together they are seeking the power you need for your life. They come to a vast indigo lake and there, in a small boat rocking on the waves, is a part of your vital essence which you lost when you were quite young during a difficult time in your life. This soul essence of yours may show itself as a brilliant flower, a radiant diamond or a joyous young child. Next to it is a powerful animal who also wants to come back to help strengthen and watch over you. After some delicate shamanic work, the shaman reaches out and embraces your soul essence and your animal ally. Together they travel back through the spirit world, over green forest, turquoise seas, and black slate mountains, back, back towards this reality where you are waiting for healing help. The shaman returns and sits up. Bending over you, she blows your soul and your animal back into your chest. Whoosh. It feels warm and expanding. You sit up and she blows the remainder of the power in through the top of your head. Wwhoo. They slide into you, bringing renewed life force and vitality. She picks up her rattle and, dancing around you, singing and rattling a healing song, she seals the power into your body and welcomes you home. You listen as she tells you the shamanic journey she took on your behalf. You may feel the seeds of hope and healing taking root inside you as you hear the story of how your soul has returned to you. You feel more complete. She reminds you of all the life force you have to work with now and offers to continue to help you learn how to use the power of your soul to overcome any reoccurring habits and illness and to bring more joy into your life. Returning soul and spirit animals helps restore power to the client. One of the secrets known to shamans is that power keeps you well. Being power-filled wards off illness, bad luck and misfortune. Power, in shamanism, is understood to be life force and universal chi. It emanates from our connections with our spiritual helpers and it must be fed and maintained. The compassionate spirits want to help us. Working in partnership with them, the shaman is able to relieve pain and suffering and often perform miracles. Beth Beurkens, M.A. 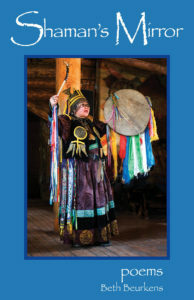 is a shamanic practitioner and has been a teacher of shamanism for 17 years and a vision quest guide for 20 years. She has been a college instructor of religion and spirituality for 30 years and is a writing coach. Beth leads dynamic life-changing seminars on the West Coast and in Europe and has a shamanic healing practice in Mt Shasta and Europe. Beth has studied extensively with Michael Harner, Alicia Luengas Gates and Sandra Ingerman. She is an instructor at Rogue Community College, The Foundation for Shamanic Studies and is a creative writing teacher. ¹ Michael Harner, from a talk at Westerbeke Ranch, Sonoma CA, April 7,2008.